A Sashimi Jellyfish is a fish pattern, formed by an incomplete Jellyfish which is stabilized by additional candidates in a box that intersects with one or more lines of the defining set. It is a single-digit solving technique. The candidates marked X form an incomplete Jellyfish pattern, with 4 columns having candidates in only 4 rows. This pattern would not be stable with only a single candidate in column 2 if the 2 candidates marked F were not present. These candidates are the fin. Either one of the F candidates is true, or the Jellyfish degenerates into a single in r6c2 and a Swordfish in the remaining 3 columns. The candidates marked * are removed in both cases, allowing us to eliminate them from the grid. This grid contains a Sashimi Jellyfish for digit 7 in rows 2, 4, 6, and 9. The participating columns are 2, 5, 6, and 8. Cells marked with X are the vertices of the Jellyfish. But the pattern is incomplete. A pure Jellyfish would have 7 as a candidate in r2c8 (the cell marked M) and could not have 7s in r2c7 and r2c9 (the cells marked F). A Finned Jellyfish would have 7 as a candidate in both F cells and the M cell. But the fins F can "stand in" for the missing 7 in M in the sense that the same eliminations as a pure Finned Jellyfish still can be performed (this is the Sashimi Observation). 7 thus can be eliminated from r1c8 and r3c8 (the two cells marked *). 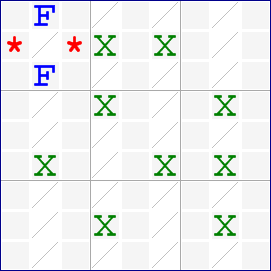 In this case, only one elimination is possible: 7 from r3c8. A pure Sashimi Jellyfish is hard to find. Several vertices need to be removed to form an incomplete Jellyfish. The pattern you see in the diagram is only one of the ways to reduce the Jellyfish. However, other reductions often lead to alternative eliminations, which are easier to spot than the Sashimi Jellyfish. This page was last modified 00:16, 3 January 2008.